Photostream views present recently uploaded photos in a chronological timeline with easy-to-view photo previews. These new views can be filtered by timeframe and by contact, helping users find the information they need quickly and directly enhancing project visibility across all project team members. 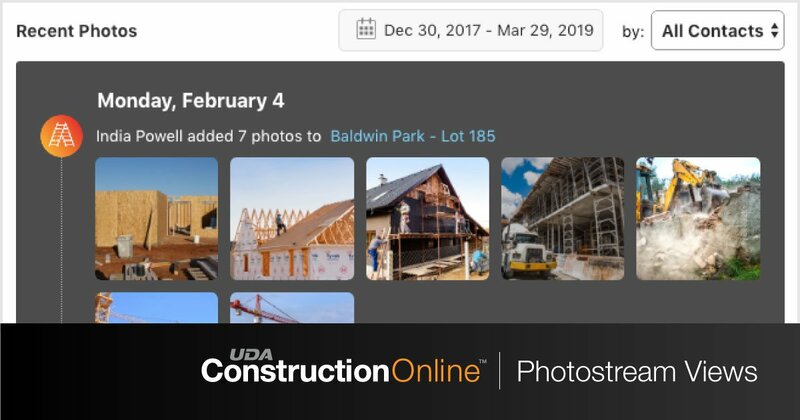 ConstructionOnline Users can find Photostream views available in Photos & Daily Logging currently. UDA Technologies continues to be a leading provider of construction management software solutions for over 550,000 users in more than 75 countries worldwide, working to manage $70 billion in construction jobs every day. Winner of 24 Top Product Awards, UDA consistently exceeds expectations industry-wide, providing best-in-class solutions proven over two decades to support the success of growing construction businesses.